First Prize winning TABLEU of Maharashtra displayed during India’s Republic Day Parade 26th January 2018, secured prominence by winning the first prize. However landed into controversy on significant issues of Arts, Sculpture and Culture. Matter of the highlight was unusual postures of King Shivaji’s horse riding Sculpture or Statue. The controversy attracted the attention of Artists, Laymen, News Reporters and appeared in Headlines of NEWS Papers. The occasion of coronation and swearing in ceremony of a King Shivaji on Raigarh, who founded Maratha Kingdom and resurrected Maratha Pride was on display in Rajpath Ratha-yatra at Delhi. It evoked the memories of parallel historic occasion of King Shivaji’svisit to Agra in 1666, on invitation from Emperor Aurangzeb who was supposed to have hatched a conspiracy to capture the King Shivaji. Fearless daring King Shivaji withstood the political pressure and power exercised Power demonstration by the mighty all powerful Aurangzeb of Delhi Sultanate. King Shivaji defied the aggressive postures of Aurangzeb with fearless daring counter postures, by staring into his eyes with his powerful looks. Contrary to this historic reference Horse riding King Shivaji displayed in Delhi Rajpath on 26th January 2018, had opposite postures and looks. The Statue provoked Intense hurt feelings of number of Shivaji’s devotees, worshippers, one of the prominent being the Blogger, Mr. Vishal Garad, who launched frontal attack on the Designer. Shivaji the King of seventeenth Century, who awakened the pride and strivings for ‘Self Rule’ now seems to have traversed through the difficult historical path of last Four centuries and today when he landed into Delhi, has been shown to be bowing before the Political Might of Delhi in 2018. He instantly raised the question, “Mazhya Rajachi Najar Khali Ka? (Why My King’s Looks are downward or his Head bowed down?). His Blog became the Headline of Newspapers on 27th January 2018. The hurt Blogger questioned the intentions of the Artist and Sculptor, who created the Sculpture on such grandiose event, relayed all over and across the world through TV channels reaching to cores of spectators and viewers. The Designer was expected to resurrect King Shivaji’s Legendry Image. Instead, the Image displayed, Blogger felt was mellowed down with tamed expressions, with eyes looking downwards and sword facing the Delhi’s Rajpath Road. This Image became irritant for the Blogger. The postures of Horse Riding King Shavaji also stood in glaring conflict with the Shivaji’s Horse riding Statues universally seen. The Artist and the Sculptor who created this Paradoxical Image came under scathing criticism and fire from the Blogger. This First Prize winning display of Shivaji’ Horse riding Statue struck many viewers on the background of jubilation and celebration of this momentous victory of Maharashtra’s Tableau (Chitra Ratha). However it was Mr. Vishal Garad was the one who captured the paradox in the scene immediately. His Blog further adds, “ Why my king’s vision, glance and eyesight turned downward, and his posture mellowed down when ‘MY KING”, instead of riding on a gallant, energetic Horse is riding on an absurd looking Horse, with Down Cast Sight holding his ‘naked sword’ pointing towards the earth (As if he had given up fight and struggle?) instead of high up towards the sky, sending message of fearlessness to the enemies. Why his assuring Vision and vibrant mood is not displayed in today’s Royal Court Tableau in Delhi’? Is this the ‘portrayal of my King?’ that fought against the humiliations by the Ruling Aurangzeb in Delhi’s Royal Court? His blog received conflicting reactions and responses. Section of the respondents despised him, expressed anger and be-wilderness for creating this unnecessary controversy and advised him to delete the Blog on the occasion of it emerging as the First Prize winner at Delhi, a pride for Maharashtra. There were few sane responses who interpreted the facial expressions of Shivaji as ‘observing the popular gathering’ on and across Delhi’s Rajpath, gazing towards his subjects”. Changed historical context is focused by couple of Bloggers, who interpreted THE MEANING OF King Shivaji’s intentions as his affectionate gaze towards the subjects. Despite the philosophy and socio-political inclinations of the blogger, the riddle or the Paradox highlighted by the Blogger deserve attention of the Art lovers and interpreting critics! Conflicting Interpretations of Postures and Intentionality! The sculpture as works of ART creates impact on the minds of Art Lovers in multiple ways. However like few respondents to Blogger, it can be agreed that this Statue with the Image so expressed “Can be a communication to mass of spectators and viewers”. Is it that, King Shavaji’s Statue created by the sculptor for display on Republic Day, was intentionally designed for conveying something different, communicating, a message to the spectators and Audience in conflict with the one displayed by Statues of King Shivaji Riding on the Galloping Horse? Missing are his determined, bold looks, vision and eyesight fixed on the imagined and assigned enemy target with ‘naked sword’ flung into the sky expressing Valor, gallantry and unparallel energy? Or did the Artist made unforgettable, unpardonable blunder, blasphemy in creating this work of Artistic Image of the epoch making King at such important and significant ceremony? 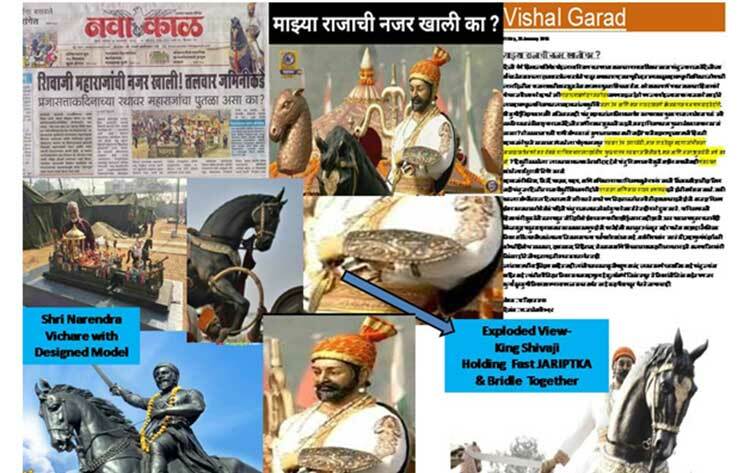 Yes, Mr. Vishal Garad, the Blogger, thinks so, when he singled out the Design of King Shivaji’s Horse riding sculpture and questioned the intentions of the Sculptor with a stinging Protest-“ परंतु चित्ररथावरची मुर्ती अशीच असावी अशी संकल्पना मांडलेल्या मेंदुचा मी निषेध करतो”. (But I protest against the Brain of the Sculptor, the idea that the Image on the Chitrarath should be such). This leads our enquiry into the terrain of Intentionality of the Sculptor and the impact the sculpture or the statue makes on the viewers, spectators and the audience. Designer had provided a fully Humane Cast to Shivaji’s Head and Facial Expressions showing compassion and benevolence and unlike the Shivaji’s known Face which expresses either Galore or Sternness. Did the designer intended to provide humble expression intentionally, and evoke from within us and the spectators emotional response of humanism, clemency and compassion with sublime repose, and prevent provocation of Brutal Religious, bigotism and fanaticism? Only Psychoanalysis may allow us to reach into the Unconscious mental Constellation and intentions of the Designer who created this statue and his thought processes. We can now have a closer look at the King Shivaji’s Horse riding Statue. The Historical event recreated was that of Rajyabhishek- coronation- King Shivaji does not stand out as an animated figure but Image of calm, restrained, King, whose anger is repressed, eyebrows raised but face with shades of slightly saddened expressions. Shivaji of the Designer- Sculptor is in reflective mood. Details of his postures, facial expressions, eyes, neck, and his sword, can be seen as condensation of several emotions, which the Artist- Designer has succeeded in articulation. As stated earlier, few respondents to Mr. Vishal Garad’s Blog viewed and interpreted the Statue differently. Shri Revdekar says, for Shivaji Raja (King) his subjects are of Prime importance and he is gazing lovingly at his people ( Not at enemy). Mr Omkar support the view”His eyesight is downward since he is gazing at his subjects-people. Mr. Bhimrao Pagdhan, while justifying the ‘Lowered down eyesight of Shivaji’,points out the intentions of the Sculptor Designer, “He intends to show Shivaji gazing at his subjects”. Psychoanalysis provides us tools to enquire further into search for the Unconscious intentions of the Artist who created this Horse Riding Statue. As we can see the Artist does not seem to be interested in creating or resurrecting a statue of Shivaji the King of 1670’s, a war mongering King but a Shivaji who confronts the Modern Historical Narratives in 2018! He appears to have imagined different stages of movements, historical and geographical- spatial, movements in creating Shivaji’s statue, resulting in to a compound image, in opposition to the known, reified and crystallized Image of King Shivaji in the popular consciousness of always at war with enemies of the Nation! One more minor but most important detail carved in by the sculptor has been missed out, by Mr. VISHAL GARAD when he says, “My king is not riding the extravagant energetic horse but a tamed awkward looking horse”. The awkward looking postures of Horse consists of , One, head turned left downwards, indicating compulsive force exercised by forceful pull through the bridle to prevent the horse from even a thinking of galloping! This is corroborated by another detail, horse’s folded right leg with two inward bends. This distorted awkward looking image of the Horse has its counterpart. King Shivaji’s left arm holds the bridle and Jaripatka together to exercise brute force over horse’s movements. King’s downward looking face demonstrates his resolve for ‘Self Control’ and psychic repression of his own aggressive instincts’. Designer, in his model designing room, has succeeded in Projecting ‘Calm facial postures’ of the king. By doing so the sculpture designer reveals his own ‘ unconscious’ mental constellation to project a SECULAR Shivaji. This stands in contrast to the section of the spectator’s awaiting jeering, to welcome King Shivaji in Aggressive postures like the one projected by Poet- Bhushan, in the wake of King Shivaji’s Coronation Ceremony on Raigarh. His poetic verses ending on a note- “कान्हजिमीकंसपर, त्यों म्लेंच्छ बंस पर| सेर सिवराज है ”. (The style in which Krishna destroyed KANS and Shivaji The Tiger –destroys the Islam / Enemy Race-) of seventeenth century. The twenty First century Shivaji stands out, unprovoked, as democratic, respecting the sovereignty of the people. Psychoanalysis alone has provided us tools to reach into bottom most regions of designer’s intentions and to understand designer ‘s mental activities and attitude in conceptualization of King Shivaji’s New Model and New Version. The unusual changes in the Shivaji’s postures, and glancing towards the emotionally charged massive gathering around contradicts his popular Image. It was as if King intended to convey unique message on the Republic Day. He appeared on Republic Day parade to salute the diversity of the people and Republic and making it clear that he does not intend to enter into the shoes of ‘THE GREAT DICTATOR’ to establish a sectarian Regime. The designer- Sculptor probably intended to create secular imagery. We have a supportive corroboration of our interpretation in TV9’s coverage of the Republic Day Parade! Commentator of TV9, Mr. Prashant Ramdasani, who was associated and interacted with Design Review of the TABLEU Set and the King Shivaji’s Statue, from “Pre display- Designing stage to Grand display on 26th January 2018, speaks out the mind of the Designing Team. While doing so he committed slip of Tongue, a million dollar, slip, regarding intentions of the Sculptor who designed the Statue. He said, on TV9 Channel, the “Horse riding Statue of King Shivaji, the Symbol of Sectarianism, Communalism”, (after realizing the mistake with momentary faltering, stumbling) corrected the slip of the Tongue, himself, “Symbol of Secularism, Shivaji Maharaj, who effectively fought against religious maniacs- fanaticism and worked against Communalism and parochialism”. Such million Dollar slip of the tongue, which we identify it as a Freudian Slip or Para praxis. This represents the manifestation or revelation of ‘Unconscious intentions or unconscious thought processes, of the Sculptor who created this works of Art. This Slip of tongue enables us to drive our enquiry further to grasp the deeper meanings of postures and facial expressions carved in to Statue of King Shivaji by the Sculptor. The commentator who was associated and interacted with designing team, right from inception, expresses through the slip of tongue the situational paradox in the current socio-political narrative and psychic conflict in the depths of unconscious mind of the designer. The repressed conflict and the thought processes in the mind of the Sculptor explodes and oozes out through the Frame of the statue to manifest and spill over in the Gestures, expressions and postures of the Horse Riding King Shivaji. We may conceive that the Designer created the Statue of King Shivaji, as “Symbol of Secularism” as the commentator corrected the ‘slip’ and who seems to have been ashamed of something un-towards currently happening around.King Shivaji, of the designer instead of regressing to 17th Century Medieval Feudal Period and socio-political disintegrations around, wisely traverses the path of historical progression to create King Shivaji of ‘Modern Times’. He transforms King Shivaji into 21st Century Model under Popular Democracy!. Probably as expressed by the commentator of TV9,, Shavaji’ postures are critical commentary on current intolerance and sends a loud message to exercise restraint and ‘Self Control’. Mr. Shivaji Garad may now agree with the designer who came under Mr. Vishal Garad’s seething criticism. Now we can recap the visual cinematic sequence of different stages in making of the King Shivaji’s portrayal as imagined by the Sculptor who transformed it from its aggressive stance. The Sequence consists of spatial-geographical and historical movement of King Shivaji, of 1670’s, riding on the galloping horse with naked sword flung towards sky finally lands at Delhi Rajpath on 26th January 2018. He brings the galloping horse to a grinding halt and under control by pulling fast the Horses bridle. The Horse experiencing the sudden ‘pull back’ by his Master, is forced to undergo postural changes. Horse, folds his Leg awkwardly and instead of galloping. His Head-neck also pulled leftwards and lowered down! Horse’s movements are in congruence with King’s Shivaji’s self-restraints. Simultaneously King Shivaji lowers down his neck and the eyesight. Dismayed by the religious fanaticism abounding hatred he brings under control anger to express anguish against fanaticism. He communicates to the Crowd his honoring of the ‘People’s Power, and salutes popular wishes with kind Gazing at the people. With curiosity he raises his head and lowers down again to respect the sane voices of secularism and compassion. The entire sequence is frozen into UNUSUAL Postures on the Republic Day. We hope we made the interpretation of the Statue to satisfy and answer the questions raised by the Mr. Vishal Garad by resolving the apparent contradictions in King Shivaji’s postural changes highlighted by Mr. Vishal Garad! If our interpretation is correct, Sculptor Unconsciously or consciously intends to send strong message to those holding the reins of power to inculcate restraint, abhor violence, and counter fanaticism. Maharashtra is land not only of those who hold fast by Independence, but land of Saints, Tukaram, Namdeo who preached and practiced, secularism. King Shivaji created by this Sculptor stands out for Democracy of the people, by the people and for the people!